Allen Smith is a founding writer for LIVESTRONG.COM. He earned his master’s degree in exercise science from San Diego State University, and worked in the first cardiac rehabilitation program in the U.S. In 1983, he was certified as a Clinical Exercise Physiologist with the American College of Sports Medicine. Since beginning his award-winning writing career in 2004, he has written thousands of health-related articles for print, the web and social media. People commonly apply Aloe vera gel to their faces to help promote clearer complexions, smoother skin and to reduce inflammation. “Aloe vera has lots of uses,” says Kim Chang, aesthetician with the Baylor Aesthetics Studio, associated with the Baylor College of Medicine. “It contains antioxidants, enzymes, vitamins A and C, and it is highly anti-inflammatory. It can help treat burns, acne and dry skin.” While health food stores and pharmacies typically sell commercially made aloe vera gel, the gel extracted directly from the plant's leaves is not only fresh, but economical too. Aloe vera (also referred to as Aloe) is a safe, popular herbal medicine that dates back more then 6,000 years in a variety of cultures. Egyptians depicted its use on stone carvings where it was known as the "plant of mortality" and given to pharaohs as funeral gifts. Fast forward to today, people keep Aloe vera plants in their homes and use the thick, clear gel from inside its leaves to treat everything from mild sunburns to acne. Before applying Aloe vera gel, gently clean your skin with soap and water. Be sure to remove any remaining dead skin cells by applying a thin layer of Aloe vera gel to your face, then lightly scrub your face with a wet washcloth or an exfoliating facial pad. “The enzymes in it can also help exfoliate the skin to make it smoother, but if you are looking for something stronger I would recommend using a grainy exfoliator paired with a pure moisturizer,” says Chang." Skip this step if you're applying Aloe vera gel to a sunburn or otherwise irritated or inflamed skin. Commercially-made Aloe vera gel can be applied directly to your face as a skin healing mask, using clean fingertips. Start by applying a small dot of gel to the skin on the inside of your wrist to insure that you're not allergic or sensitive to the gel. Wipe clean, and allow it to dry. Assuming you're not allergic to Aloe vera, apply a small dot of gel on your fingertips and apply to your face, using small, concentric circles. Repeat until all of your skin is covered. Depending on the desired effect, you can either remove after 30 minutes or repeat the application every few hours. You can also apply Aloe vera directly to your skin to reduce inflammation, soothe insect bites, help heal sunburns, minor abrasions and skin irritations. Warning: If you experience redness, redness or swelling, DO NOT apply Aloe vera gel to your face. Check with your dermatologist before using, especially if you have sensitive skin or a history of allergic skin reactions. To harvest Aloe vera leaves from its plant, grip the base of leaves with your fingers and gently pull away from the plant. You can also use a pair of scissors or sharp knife. Clean the dirt from the surface of the leaf by gently scrubbing them with a wet toothbrush or nailbrush. Rinse the leaves under cold running water. Cut and and remove the base of the leaf. Remove the spines from the sides of the leaf using a sharp kitchen knife. Remove the skin from both sides of the leaves using a kitchen vegetable skinner, or cut the leaf in half vertically and scoop out the gel using a small spoon. Store the gel out of direct sunlight in an air-tight, plastic container. Cut a 2-inch piece from the leaf you've harvested. Remove the skin from one side of the leaf. Cross-cut the Aloe vera gel and sprinkle with a generous portion of baking soda. Scrub your skin in a circular motion using the leaf. Clean and rinse your face with warm soap and water. To create an inexpensive Aloe vera toner, mix 2/3 cup distilled water with 1/3 cup Aloe vera gel. Pour into a clean, airtight bottle and refrigerate. Shake the bottle well and apply the toner to your face with a cotton ball or pad. Beneficial healing properties: Aloe vera has been shown to increase collagen content in wounds, a critical factor in restoring tissue strength. Protection against ultra-violet and gamma radiation: Wound dressings containing Aloe vera reduce acute radiation skin reactions, when applied daily for two weeks. Anti-inflammability. Aloe reduces prostaglandin production, known to exacerbate inflammation. Benefits on the immune system: Aloe inhibits the release of histamine and leukotriene from mast cells. Laxative effects: When taken internally, anthraquinones present in Aloe latex, increases intestinal water content and intestinal peristalsis. Anti-viral and anti-humor activity: Anthraquinone aloin contained in Aloe inactivates viruses like herpes simplex, varicella zoster and influenza. Moisturizing: Mucopolysaccharides contained in Aloe help to bind moisture to skin, soften hardened skin cells and tighten pores. Antiseptic effects: Aloe ontains lupeol, salicylic acid, urea nitrogen, cinnamonic acid, phenols and sulfur that inhibit actions on fungi, bacteria and viruses. 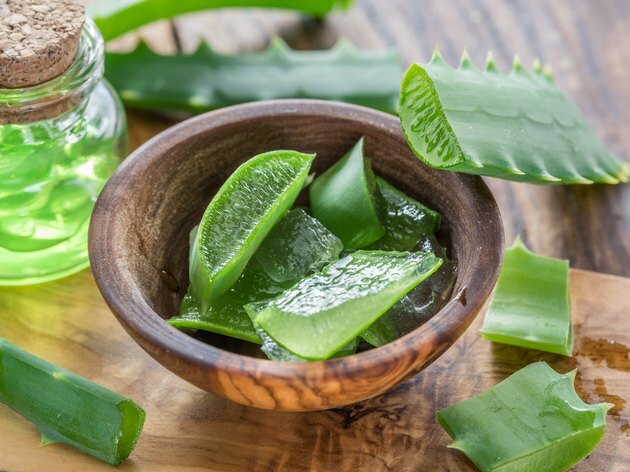 Whether you choose commercially available Aloe vera, or grow it in your own home, it can be an inexpensive, effective and handy addition to your medicine chest.